A worker at a Basra oil refinery. 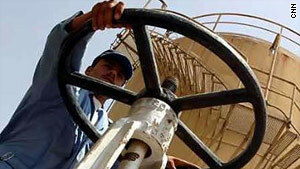 For Iraq, boosting the country's output and securing oil wealth is a key priority. The country has an estimated 115 billion barrels of crude reserves and according to experts much more untapped. Many believe the oil rich region of Basra could hold the key to Iraq's economic revival. But as MME found out, there are a number of hurdles along the way. In a major milestone, Russia's largest oil producer expanded its presence in the Middle East. State-run Rosneft joined forces with Sharjah's Crescent Petroleum to develop a major onshore gas field in Sharjah. Crescent Petroleum's Executive Director, Badr Jafar tells us about the significance of the deal, the energy challenge and how this deal serves as a platform for other projects in the Middle East.